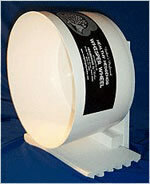 We consider WHISPER WHEELS to be the most important cage accessory that you can provide your pet hedgehog!!! We have not met very many hedgehogs who do not go nuts for their wheels! We encourage our hedgies to use wheels. They seem to take to them naturally. WHISPER WHEELS provide very healthy exercise for hedgehogs of all ages. We even frequently observe baby hedgehogs, too young to be weaned from mom, tooling around on the wheel! 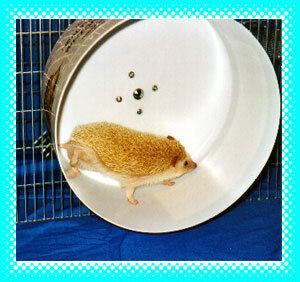 Your pet hedgie will spend hours running and running on his HEALTHY HEDGEHOG WHISPER WHEEL! Two decades ago, when we first went looking for a commercial wheel for our hedgies, all that we found were ferret ones. Those pose several problems. One, they have wire floors which tend to allow little hedgehog feet to fall through. Second, they have spoke supports. We have heard of hedgehogs getting their heads wedged in these supports, sometimes with disastrous results! Third, these wheels are very squeaky. Since that time, some large pet product manufacturers have developed a couple new solid running surface wheels designed for chinchillas and pet rats. They looked promising for hedgehogs, but we were quickly disappointed with them. One style is supported by a center shaft. The shaft is the Achilles’s Heel. Since it is plastic it tends to fatigue under the weight of an adult hedgie and will break. You would probably end up purchasing and replacing many of these wheels over the life of your hedgehog. Another commercial version came out a few years back. We got excited about this one, since it was not supported by a shaft. Unfortunately this wheel has no resistance and allows the animal to get it going at a high rate of speed. Stopping becomes a critical problem. We have heard horror stories of hedgehogs being ejected from these wheels when they don’t pace themselves into a gradual slow down to stop. In addition, this brand of wheel is made of two pieces of molded plastic that snap together right smack dab in the center of the running surface. If you are fortunate enough to own a hedgie that learns to operate and slow this wheel effectively, there is still another danger! Over time the two pieces of plastic tend to separate. More than a few hedgehogs have had their toe nails caught in the resulting crack….many have had the nail ripped out while running!!!!! Buyer beware. We eliminated these problems by developing our own line of hedgehog wheels! 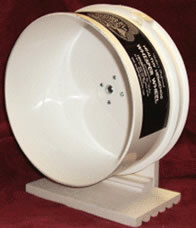 Gary manufactures all of our own hedgehog Whisper Wheels. Feature a Drum Design – No dangerous cross supports! Feature Solid Floors – Easy on little hedgehog feet! All Vinyl Parts (including the base) – Easy to clean and disinfect! 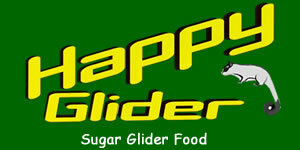 The Clamp On Wheel models are designed to be used on wire cages only. The Free Standing Wheel models can double as a clamp on unit which makes it very versatile for a variety of cage styles! 11″ Diameter. We recommend this model for all hedgehogs. Adult animals have an easy time galloping on this large diameter wheel. This wheel is featured in the video clip. Always available in WHITE. Occasionally available in colors… Ask Us! Designed with those “FULL Figured” hedgehogs in mind! This wheel was designed by Gary after numerous requests for an extra durable pro-wheel that will not warp out of shape under HEAVY (pun intended) use. This double walled wheel is the solution! 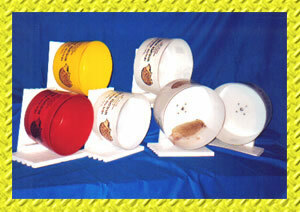 Super sturdy & more durable than other hedgehog wheels available…The HEFTY HEDGEHOG® PRO-MODEL Wheel is the answer!!! Note: Since we use professional grade “Black Hole” brand wheels and speed bearings, this puppy spins effortlessly for baby hedgies and “Big Bertha” hedgies alike! Always available in WHITE. Occasionally available in colors. If you are purchasing one of our DELUXE HEDGEHOG CAGE SETUPS, and would like to Upgrade to a HEFTY HEDGEHOG PRO-WHEEL, we can certainly do that for a simple $10 Upgrade fee. ***NOTE: At HEDGEHOGS by Vickie, we use and prefer THE ORIGINAL WHISPER WHEEL with the majority of our hedgies. 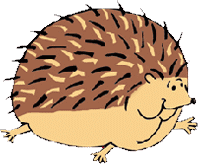 Yes…..we do have a couple of “fluffy” hedgehogs that require a HEFTY WHEEL….but they are few and far between. If your hedgie can curl up into a ball and tuck most everything inside, we would recommend THE ORIGINAL WHISPER WHEEL. Like everything else in life, there are pros and cons. Since the HEFTY WHEEL is double walled, it is also double the weight. Even with the use of a locking washer, the HEFTY WHEEL will have a slightly greater slope to the running surface than the ORIGINAL WHISPER WHEEL does.